Windows provides lots of features to help you enjoy using their operating systems.They Work hard to try and make Windows User's Work Easier. Unfortunately, these features associated with Microsoft products do encounter a number of issues or problems such as Error Code 0x800700b7. Even if, Microsoft tries their best to provide ways and means of overcoming such problems. System Restore and Backup feature in windows has proved to be very helpful over all these years. This is a valuable feature that backs up your PC files and configurations. You can use the backed up files and configurations to restore your PC in case something happens that interferes with its smooth operation. Like with any other Microsoft feature, the System Restore and Backup feature does encounter problems. This is why you can encounter Error 0x800700b7. The occurrence of this error simply means that the application associated with the system restore feature has run into a problem. This means that it can neither backup nor restore any backed up files or configurations.The most likely moment when you may encounter this error is when trying to Restore your PC. An installed Third-party antivirus/malware program that stops the system restore feature from accessing files that the antivirus program flags as a file as a threat to your PC system. Note that the built-in Firewall program can also do this. Corrupt system files, which may be as a result of virus/malware infection. Incorrect configuration of system settings, which can be due to installation of a program that alters system settings. Failed or incomplete installation of a program, which leaves invalid entries in your PC's Windows registry. Incorrect shutdown of your PC, which can occur due to power failure. You can easily resolve error 0x800700b7 by installing any programs that is downloaded but not yet installed. Check to see whether or not there is any program that you may have downloaded recently. Ensure that it is fully installed.You may go a step further to check if there are any pending updates that need to be installed just in case they were not installed automatically. Note also that it may be necessary to uninstall any program you installed recently. The installation of the program may be causing interference that prevents the system restore feature from working properly. Run the built-in system file checker utility to correct any corruption in system files. Type "CMD" in the resultant box. Type "sfc/scannow" in the command prompt window that appears.Give the utility time to run before continuing to work to see whether or not the error is corrected. Using your PC over time leads to accumulation of cache in system tray. Continued accumulation of cache can easily cause corruption in the registry, leading to occurrence of error 0x800700b7 and other Windows errors. Clearing system cache requires that you have administrative right to the PC. Press Windows Key and R together to open registry editor. Navigate to the key "HKEY_CURRENT_USER" >Software\Classes\Local Settings\Software\Microsoft\Windows\CurrentVersion\TrayNotify. Delete the "IconStreams" and "PastIconsStream" keys. Press the combinations of CTRL+ALT+DEL to open task manager. Right-click on "Explorer.exe" and end the task process. Your PC will automatically refresh the system tray and all the icons will be backed up without any issues. This should serve to correct error 0x800700b7. 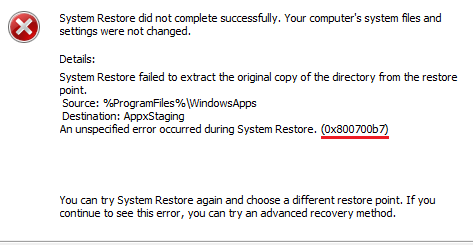 The Windows error 0x800700b7 can appear to be a minor problem. Indeed, it does not prevent you from using your PC. However, leaving the error unresolved for long can be the cause of other errors. This is why it important that you correct it at the earliest opportunity possible.